Scientists in the US have used a new drug design strategy to remove the cardiac side-effects of a popular cancer drug. The approach could help make other cancer treatments safer, researchers say. Imatinib, marketed as Glivec in Europe and Gleevec in the US, has been used to treat myeloid leukaemia (CML) and gastrointestinal stromal tumor (GIST) since 2001. The drug targets proteins called tyrosine kinases that are involved in cell reproduction. In GIST, one class of these proteins - the KIT kinases - can become permanently ’switched on’, making cells divide uncontrollably. But imatinib is known to cause heart problems in some people because it also switches off tyrosine kinases in the ABL family. Now three teams working together at Rice University and the M. D. Anderson Cancer Center in Houston, Texas, have redesigned imatinib so that it only inhibits KIT kinases - and not ones in the ABL family. The team used a novel insight to design the compound - examining how water molecules detach and attach from the drug targets. These ’de-wetting’ differences helped the team to identify how best to make modifications to imatinib’s structure. By adding a methyl group at a critical point, they made a new compound named WBZ_4 that inhibited KIT kinases - but not those from the ABL family. In addition, WBZ_4 also inhibited JNK tyrosine kinases - an effect that is known to further protect the heart. 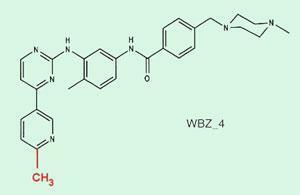 The team then conducted mouse studies on the new drug and showed that WBZ_4 maintained the anticancer activity of imatinib but is less cardiotoxic. Imatinib (top) binds to both KIT and ABL kinases. 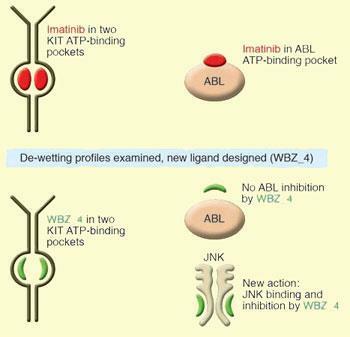 Imatinib was redesigned to produce WBZ_4 (bottom) which binds to KIT and additionally JNK kinases, but not ABL. ’The approach used here holds great promise to allow more customized development of rationally designed therapeutic agents,’ commented George Demetri at the Dana-Farber Cancer Institute, Boston.